Here is a free flower design and a little bit of homework. 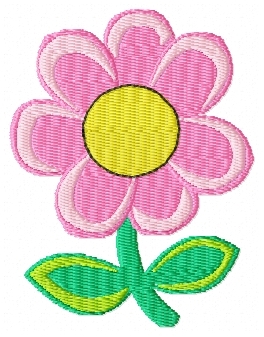 I have digitized this design with a few mistakes – they are not huge mistakes (for example, forgetting to digitize something or wrong colors), so you will have to download the design (below) and bring it into your Embird program and use the sew simulator to find the mistakes. Anyone figure out the mistakes yet? Keep trying if you haven’t figured it out! Thank you for these and the homework, first time I’ve ever wanted to do any, LOL. Wahoo! Homework is good for everyone – and embroidery homework IS fun! Make sure you post your results! Ok I will give it a try. I’m new to the software in general, so just trying to get the design into Embird was a challenge! There is no underlay in the yellow, light pink and light green. Also the center yellow is outlined in black. I just found your site today and I think I am in heaven. Finally, I think I can learn to digitize and edit a design. I have spent so much on various software programs that I could not learn. Thank you so much and I am looking forward to this journey. Glad you found us! Enjoy learning – you will be up and running in no time! Were do we submit out answer? Yay Nikki! you can email it to us at omlembroidery@gmail.com!